Grand Central Publishing, 9781455574025, 288pp. "Stunning. . . Unique and unforgettable." 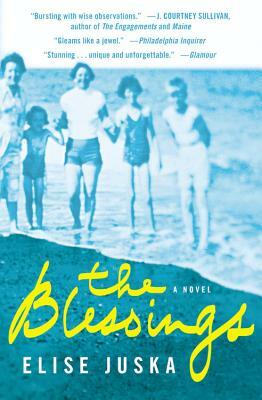 Hailed by Stewart O'Nan as "deft and tender" and as one of the best books of 2014 by the Philadelphia Inquirer, Elise Juska's THE BLESSINGS is an extraordinary novel about an ordinary family. The Blessings rally around one another in times of celebration and those of sorrow, coming together for departures and arrivals, while its members harbor private struggles and moments of personal joy. College student Abby ponders homesickness in her first semester away from her Philadelphia home, while her cousin Stephen commits a petty act of violence that takes a surprising turn, and their aunt Lauren faces a crisis in her storybook marriage she could never have foreseen. Through the lens of one unforgettable family, this beautifully moving novel explores how our families define us and how we shape them in return. Elise Juska's fiction and nonfiction have appeared in Ploughshares, Gettysburg Review, The Missouri Review, Good Housekeeping, The Hudson Review, and many other publications. She is the recipient of the Alice Hoffman Prize for Fiction from Ploughshares and her work has been cited in The Best American Short Stories. She lives in Philadelphia, where she is the director of the undergraduate creative writing program at the University of the Arts. "#1 . . . A stunning wide-angle snapshot of the Blessing family of Northeast Philadelphia. . . They could be any family-and yet, in Juska's capable hands, they're unique and unforgettable. "—Glamour, "The 10 Best Books to Add to Your Summer Reading List Right This Second"